There is an overwhelming feeling among the members of our sport that when Dale Jr. wins, all is right in the world of NASCAR. But after Dale won at Pocono a couple weekends back, the ratings for the race were down significantly. That gave me and a few other people pause. It was like the New York Yankees were winning key games and making their way to the World Series, and their ratings dropped. Still, that was kind of weird for me. I just always assume that fans like it when their favorite driver wins. But obviously, there’s something more to it, and it got me thinking. The importance of that question was really driven home to me this week after NASCAR asked me to help test its next generation car, which I’m doing this coming Monday at Michigan International Speedway. Having a sense of what great racing is seems pretty important when it comes to deciding the kinds of cars we should be driving. So this week, I’m devoting my blog to what I think great racing is. But I don’t want the discussion to stop there. Next week, I’m going to kick off a live, scheduled discussion about this on Twitter with the hashtag #GreatRacing, and I want everyone across the country — fans, media, teams, drivers, track owners, you name it — to join in. For me, the thing that really makes a race is watching a driver’s skill set really shine through. When you see a racer who’s just heads and tails above the other drivers, and you’re watching him perform and it’s clear his success is because of him, that always blows me away. One of the newer Team Penske drivers, Alex Tagliani, was recently driving the No. 22 car at Road America. It began to rain, and he started blistering the field. Rain on a road course is, in some ways, an equalizer because navigating rain is a driving skill, and Alex was just blowing past people. That impressed me. And even though there wasn’t a lot of side-by-side action and/or a last lap pass for the lead, I loved it. I could have watched it all day. 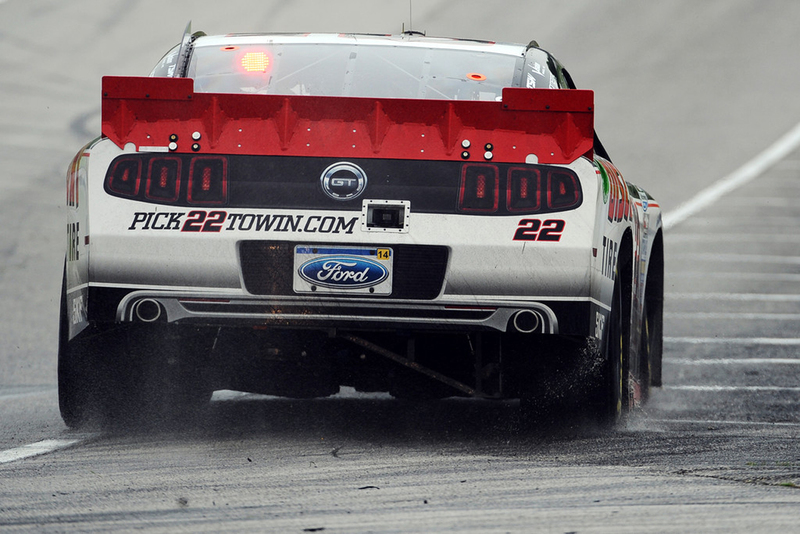 ALEX TAGLIANI’S PERFORMANCE IN THE RAIN AT ROAD AMERICA EARLIER THIS YEAR WAS SOMETHING TO BEHOLD (GETTY IMAGES). Kyle Larson was incredible at the Eldora truck race a couple weeks back. Kyle excels at dirt racing, and NASCAR’s truck series runs one dirt race a year. At Eldora, he drove from the back of the field to the front, hitting the car off the wall every lap, until he passed through for the lead. It is extremely difficult to pass people there one time around the track, let alone every time. He ran in the lead for about five laps before his truck fell apart — mainly because he’d hit the wall so many times to get to the front. Still, it was great. His skills and bravery were on display. Marcos Ambrose proved again this past weekend at Watkins Glen that he is a phenomenal road course race racer. You can tell just by watching him that his speed is all related to him and the things that he does behind the wheel. But perhaps the driver that sticks out most in my mind for his skills is Dale Earnhardt, who was known for being heads and tails better than everyone on restrictor plate tracks. He really developed, whether knowing it or not knowing it, the driver style that everybody uses today on super speedways. He would go to a restrictor plate race, drive through the field, and it was all just pure driver. It was a sight to see. There’s a race that he ran at Talladega in 2000 — October of 2000 — when he drove from somewhere around 17th to the lead in three or four laps, all because he knew how to draft at a higher level than everyone else did. Today, pretty much the entire field copies everything he created 10 to 15 years ago, as far as styles and techniques are concerned. Next on my list are uncertainty and probably the most obvious thing that makes for great racing, late race drama. Alone, they’re elements of any great race. When both hit, it’s really special. Uncertainty is what makes Daytona and Talladega so great. In restrictor plate races, you’re on pins and needles for the entire race. When you’re in the pack, you can really feel the energy ramp up at certain times in the race. You can see the cars in front of you, and the aggressiveness of the moves they’re trying to execute. You know that there are going to be a minimum of two big crashes a race. You’re thinking to yourself, “All right, the big one is going to happen here any second. Is it going to be now? Is it going to be later? Is it not even going to happen at all?” At different points, every driver is faced with a decision: Do I want to stay a part of the pack or not? There’s an energy to all of that, which everyone feels, from the drivers to the fans in the crowd and at home. The critical part of late race drama is that it has to be organic. A debris caution and a legitimate caution are two different things. If there is a wreck, that’s one thing. If it’s a debris caution, it’s no longer organic. It just doesn’t feel the same. The end of the race, of course, is when you see some of the most dramatic action in our sport. Dale Earnhardt perfected a technique, the bump and run, that led to a couple of my great moments of late race drama. In two races at Bristol — one in 1995, one in 1999 — he used the bump and run to try for a win on the final lap. At Richmond in 2003, Kevin Harvick and Ricky Rudd battled each other late in the race, ending in a wreck and near fight. And in Atlanta in 2005, Carl Edwards passed Jimmie Johnson on the final lap by running the wall to do it. It was a great finish, especially at the time, when running the wall wasn’t as common. Personally, I’ve been involved in two pretty incredible races that featured uncertainty and late race drama, coming out on either side of the win. The first was with Carl Edwards at Talladega in 2009. Everyone knows the race because Carl flipped at the finish, but everything that came before that was just as dramatic, especially for me. With three laps to go, I decided to try a two-car tandem draft to go for the win. And I decided that Carl would be the one to try it with me. So I pushed up behind him, locked bumpers, and away we went. We didn’t discuss it at any point. I just started the maneuver, and Carl went with it. Here’s the thing. No one had ever tried it before, and there were good reasons for that. First, it never worked in practice. The back car would always overheat after two laps. It also introduced a couple big obstacles when it came to execution. If you were in the back car — the car that would be in control if you ran the tandem — you couldn’t see a damn thing. And if you were in the front car, you had virtually no control because you were being pushed. But it gave you a tremendous speed advantage, so before the race, I had decided: If I had a chance to win with a few laps to go, I was going to give it a shot. By the final lap of the race, every gauge in my car was in the red. I had to let Carl go, but if I was going to have a chance to win, I had to time it right. For one thing, there were two cars behind us running a tandem as well. If I made the move too early, they might catch me. At the same time, if I made my move too late, I wouldn’t have the time to pass Carl. And of course, at any moment, my car’s engine could just blow up, so there was that, too. I was uncertain of what was going to happen, but I knew it was going to be pretty dramatic. I decided to go with the racing equivalent of a crossover dribble on the last turn. I faked up high. Carl took the bait.When I dropped down low to pass him, he recovered faster than I thought he would, but it wasn’t quick enough to stop me. The nose of my car was already past his rear quarter panel at that point. We made contact. Carl went airborne. And we wound up with one of the most dramatic finishes I’ll ever be a part of. The other race that comes to mind for me in terms of late drama was at Watkins Glen in 2012. With two laps to go, Kyle Busch was leading, followed by Marcos Ambrose, and then me. What none of us knew was that another car had broken an oil line, and it was still trying to finish the race. Oil had leaked out all over the groove for pretty much the length of the entire course. All of sudden, the three of us start slipping all over the place. At first, I thought there was something wrong with my tires, but then I figured out what was happening. Kyle was too far ahead of me to be caught, I thought, so I decided I would try and drive cautiously, that maybe I might be able to catch Marcos. Sure enough, as we headed toward the end of the second to last lap, I did just that, slipping past him into second, but he was still right behind me. The white flag went up. Kyle still had the lead. But as he went into the first corner, he lost control of his car and slid off the track. (So did Marcos.) I turned to go underneath Kyle. We collided, and the No. 18 spun out. My left front fender started smoking. I couldn’t tell what was happening — I thought maybe the left tire was going to fail. At the same time, I was in lead, with Marcos right behind me. What happened next was crazy. On the next turn, we both slipped off the grass. I still held the lead. But on the turn after that, something amazing happened for Marcos. He slid on the oil in the groove, but the car moved right into a totally dry stretch of track, and it gave him a spectacular run. All of a sudden, we were side by side. Even so, I still thought I had a strategy that would get me the win. By this point, it was clear that all of the oil had leaked right into the groove. So I decided that on the next corner, I would enter way out of the racing line, grab onto the dry cement, and ride it to the front — and hopefully, the win. What I didn’t know was that by that corner, the driver of the leaking car had finally realized that he was leaking. So in the interest of helping out his fellow drivers, he had actually stayed out of the groove at that spot of the track. I slid. Marcos didn’t. He took the lead, and won the race. Three aspects of racing that people don’t give as much recognition for making a great race are the tracks themselves, and the game-changing moves made by great teams. One of the things that always strikes me is when we race at a track where we haven’t raced for a while, or for the first time ever. There’s a special kind of energy to the crowd there, even in the days before the race. Everyone shares in the excitement, from the drivers to the fans. Some tracks are just really racy and fun to watch. I think of Iowa Speedway, where we just raced. You can run different grooves. You can run side-by-side. And you can see all the action from one place if you’re sitting in the grandstands, which is pretty awesome. In general, tracks that have multiple grooves make for great racing. 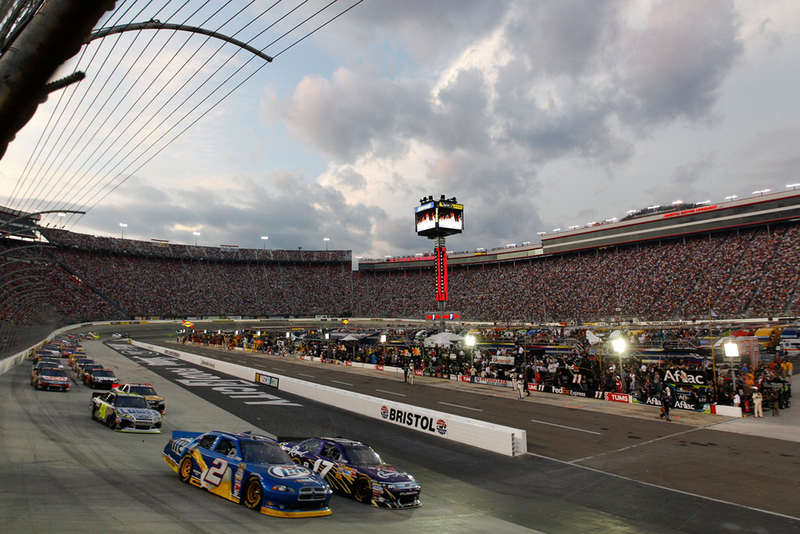 Bristol, Homestead, Atlanta — all the tracks with older pavement are fun in that way. CERTAIN TRACKS, AND THE CROWDS THEY DRAW, HELP TO MAKE A RACE GREAT. The short tracks are a blast, too. I like Martinsville. It’s fun to watch because it’s tight confines, and the cars require a special skill set to drive. You can’t necessarily run side-by-side there, but you can really work each other and traffic there. Finally, there are certain tires and track combinations where you can set your car up to run either really fast for a short run, or really fast for a long run. Those are interesting. You always get the driver that takes off kind of like he’s in a horse race, running great out of the gate with five or six lengths on the field. But later, at the back half of the race, he’s fourth or fifth, and the long run horses run him down. Those are fun to me, too. When circumstances change at a track is when you see a great team spring into action. Let’s say we’re supposed to race on a Saturday night, and it rains out. It was going to be 65 degrees and overcast. But now we’re racing on Sunday, and it’s 85 and sunny. The car is just not set up for that. So on the first run, the car just drives awfully. The team has to make adjustments, and those adjustments can make the race. So that’s what I think makes good racing. But everyone likes something a little different. I’m curious to know what other people think. Fans, media, other drivers: What do you think great racing is? What kind of racing do you love? And what types of racing do you want to watch the most? I’m looking forward to hearing some of your answers in response to the blog, and when we talk about it live on Twitter next week (#GreatRacing). Together, maybe we can keep improving the sport we all love.